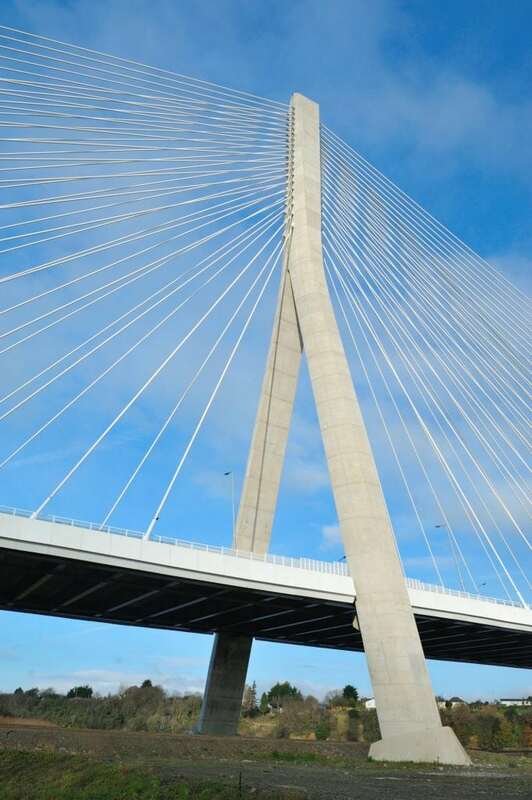 The Waterford Cable Stayed Bridge crosses the River Suir and forms part of the N25 Waterford City Bypass. The bridge was officially opened to traffic in October 2009. It is the longest span bridge in the Republic of Ireland measuring 475m. Alongside the Waterford City Bypass together with the Waterford to Dublin Motorway, traveling has been positively transformed in the Kilkenny and Waterford counties. Construction commenced on this project in 2006 and was it was officially opened in 2009, taking a total of 42 months to complete. The concrete piers of this iconic bridge were constructed using Ecocem saving thousands of tonnes of CO2 and greatly increasing the lifespan of the bridge. One of the most stand out features of this bridge, and gives it its name is the cable-stayed design. Not only is it very aesthetically pleasing but it removes the need for intermediate supports or piers in the river and allows for a longer deck. This means there is little to no construction in the river flowing beneath. With the specification of GGBS in the concrete, the durability of the bridge is improved and makes the concrete more resilient to attack and degradation. This is especially important given its proximity to the river.